If you picked up "Six Feet Down Under," you may have noticed the words "EP One" on the package and were quick to ask "what the hell does that mean?" Well, drum roll please . . . you guessed it, there is indeed an "EP Two" in the works . . . very clever clue, don't ya think? 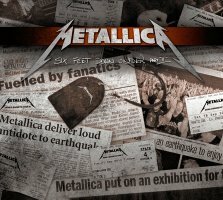 Look for "Six Feet Down Under Part II" in Australian and New Zealand stores, along with metallica.com and metclub.com, on November 12. In our quest to have something unique and special to celebrate our long overdue visit to this part of the world, as well as the final stretch of World Magnetic tour dates, we wanted to release some live recordings from previous tours on EP # 1 and a companion EP from the current 2010 tour. The first time around we called on you to send us your bootleg recordings from those earlier tour dates going back as far as 1989 and we pulled a track list together from the submissions. Once again we went to you, the 'Tallica faithful, for help and polled Fan Club members from Australia and New Zealand to come up with their top eight picks from all the 41 songs played during the early part of the Trans-Tasman run this year.